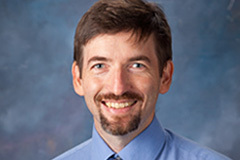 Dr. Mac Laughlin teaches applied ethics and philosophy of knowledge. He specializes in healthcare ethics, philosophy and science fiction, game-based learning and the philosophy of Bernard Lonergan. He is the publisher and editor of the Journal of Science Fiction and Philosophy. "A Typology of Moral Conversion." Lonergan Workshop, Vol. 23, 277-306 (2012). St. Ambrose University, May 2014: "The Nature of Suffering." Chicago Catechetical Conference, November 2011: "Creative Approaches in End-of-Life Dilemmas." Lonergan Workshop, Boston College, June 2009: "On Moral Conversion," a four-day afternoon workshop. Association for Practical and Professional Ethics, Cincinnati, Ohio, 2009: "Philosophy for Children & the Community of Inquiry: Ethical Education through Dialogue & Inquiry" (Panel Chair). Loyola University Chicago Brennan Graduate Conference, 2007: "Richard Rorty and Bernard Lonergan on Sentimental Education." Lonergan Workshop, Boston College, June 2005, 2006 & 2007: "New Horizons in Lonergan Thought" (Afternoon workshop). North American Sartre Society, Purdue University, 2003: "Trapped in a paradox: Sartre's Quest for the Justification of Existence." Boston College Graduate Philosophy Conference, 2003: "Reconciling Narrative and Systematic Ethics: Aristotle on Narrative Ethics." The Ethics in Contemporary Life Conference, Northeastern Illinois University, 2002: "Patterns of Medicalization: A Philosophical Perspective on the Expansion of Modern Medicine."